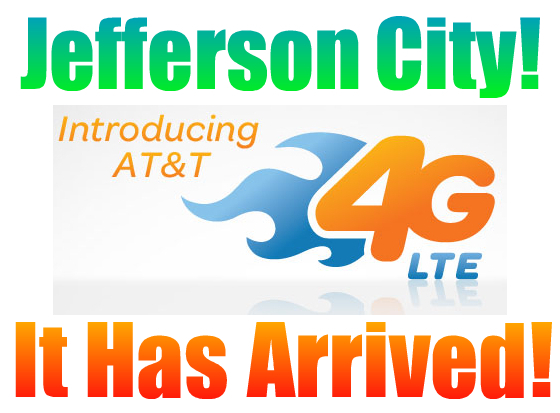 AT&T 4G LTE Arrives In Jefferson City Area! CENTRAL MISSOURI GETS LTE! WHO NEEDS T-MOBILE ANYWAY? Last friday while at work, something came as a bit of a surprise to me. I found out that 4G LTE was launched and pumping out super speed Internet juice to Jefferson City devices. One by one, I had several fellow geek buddies at work come running to me to tell me that the 4G LTE icon lit up on their phone. I was shocked, and super excited. At first, I thought to myself, "maybe it's a mistake, and they accidentally switched the logo on". But there was no mistake about it. 2 friends were downloading at speeds of 25Mb/s right here inside the office. The best speeds under optimum conditions that we had received before was 11Mb/s under HSPA+ service. Apparently, the system is still being tweaked. Several people have already told me that their download speeds have increased over the past week. So we are officially on the high speed map! I had worried about how long it would take for the expansion after the merger between AT&T and T-Mobile was shot out of the sky by our fabulous regulators. I was a strong proponent of the merger, and I knew it would slow the LTE expansion process when it failed. But who needs T-Mobile now? Even if the T-Mobile merger did go through, it may not have sped up the expansion for Central Missouri anyway. At the time, T-Mobile did not even have a 3G tower in our area. We were paying for HSPA+ "4G" service, and getting Edge Network speeds. I'm guessing that the same amount of work would still have been required to build the LTE infrastructure here. But I digress... AT&T 4G LTE is here in Jefferson City, and I couldn't be more excited! Next month I hope to get my hands on a Samsung Galaxy S IV when my upgrade becomes available. That will be perfecct timing to pick up my new device right when the LTE network has just gone live! No more bragging, my Jefferson City Verizon friends! You're not the exclusive Central Missouri LTE service any more! Well, U.S. Cellular already took that title away from you. However, pretty soon I'll have the ability to "one-up" you... when I call you on your smartphone and surf at LTE speeds at the same time! Sorry, you won't be able to surf while you're taking to me. AT&T offers several LTE-compatible devices, including new AT&T 4G LTE smartphones and tablets. AT&T invested nearly $2.15 billion in its Missouri wireless and wireline networks from 2009 through 2012. AT&T launched 4G LTE in Farmington in April 2013, St. Louis in April 2012 and Kansas City in November 2011. AT&T’s innovation and investment has resulted in the nation’s largest 4G network, covering 288 million people with ultra-fast speeds and a more consistent user experience. Our 4G LTE network delivered faster average download speeds than any of our competitors in PCWorld’s most recent 13-market speed tests. AT&T’s 4G LTE network delivers speeds faster than many other mobile Internet technologies, as well as multiple innovations that optimize the network for performance. Our network’s radio components are placed close to the antenna at most cell sites, instead of inside the base station, which helps minimize power loss between the base station and antenna and, in turn, improves the performance of our 4G LTE network. The network also is designed with its core elements distributed across the country, which helps reduce latency, or the delay when using the Internet, because your request isn’t traveling as far. *** 4G LTE device and data plan required.Learn more about 4G LTE at att.com/network.